John McAbery lives and works on a remote area of the California coast in a small handmade cabin without electricity or telephone. His workspace is a small table with a vise attached, a few hand tools and nothing else. John uses naturally fallen California bay laurel. The blocks of wood he starts with can weigh as much as 100 pounds, yet his finished sculptures weigh as little as 4 ounces. His partner Gretchen Bunker helps with the design and finishing of the work. 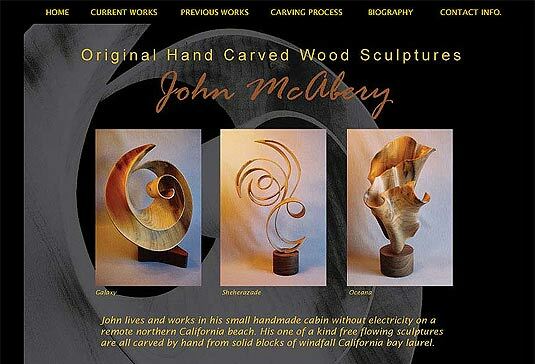 To begin the process, John creates with ribbons, clay or foil a three dimensional model of the sculpture. He also draws inspiration form seaweed and shells found on the beach. His designs are drawn on both sides of the block and the carving begins. He uses keyhole saws to rough out his piece. Then he continues to refine the sculpture using smaller keyhole saws, gouges and microplanes. After days of cutting and shaping, a rough sculpture finally emerges from the block. John uses sandpaper in successive grits to continue refining every twist and curve. The piece is finish sanded down to 600 grit, then polished with a blend of beeswax and carnauba. His Site contains a short biography, photos of sculptures in progress and portfolios of his current and past work. John’s peaceful lifestyle and his passion for carving will continue to be an inspiration to many.